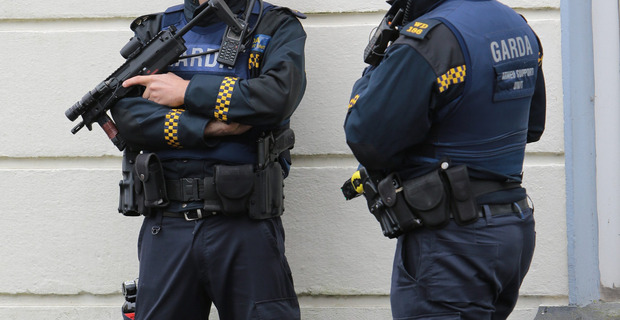 ARMED gardai have raided the headquarters of a Dublin motorcycle club whose members led the cortège for the gangland funeral of a Kinahan cartel associate. Early this morning heavily armed officers attached to the Emergency Response Unit (ERU) and local Gardai carried out searches of the Crumlin property as part of an investigation into the motorbike gang’s Dublin chapter. The group came to prominence almost three years ago when a number of its members led the funeral cortège of David Byrne (33), who was shot dead in the Regency Hotel as part of the Hutch/Kinahan feud. The bikers led a large convoy of stretch limos carrying Byrne’s family and associates, with dozens of prominent mourners dressed in matching black suits and blue shirts. The dawn raid this morning also involved local Garda units including members of the Sundrive Road drug unit and district detective unit, who have been carrying out ongoing investigations into the motorcycle club. Sources said that a large number of suspected weapons, including close to 100 knives and swords, were seized during the operation, along with documentation. The Crumlin property is the club house of the motorcycle gang and has been described as a “compound” with a number of small buildings built inside. No arrests were made today as part of the Garda searches but investigations are ongoing. This morning’s raid was carried out almost three years to the day that three motorbikes driven by the club’s members led the funeral procession of David Byrne as it made its way from his family home in Raleigh Square to the church St Nicholas of Myra on Francis Street. The Kinahan cartel associate had been shot dead at the Regency Hotel days earlier as part of the Hutch/Kinahan feud, which has claimed up to 19 lives to date.